Whether they are selling clothes in a mall or books on a website, retailers have to walk a fine line. They must offer help to customers who want assistance, while taking pains not to intrude on their privacy. 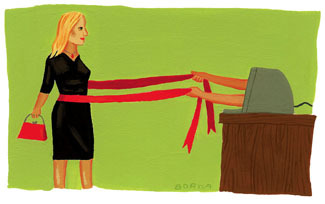 etailers face a challenge in developing the appropriate approach to offering customers help. Salespeople can wait until approached by customers. Or, upon spotting a customer browsing at a bookshelf, a salesperson can approach and ask if the customer needs help. Or, the salesperson can grab a book and suggest the customer might like it. There are pitfalls to each approach. And of course, offering help does not always benefit retailers. When Safeway, the supermarket chain, encouraged employees to offer help to indecisive consumers without waiting to be asked, the program backfired. Many consumers viewed it as an invasion of their privacy, while many Safeway employees felt uneasy about observing customers. Online retailers face a similar challenge. They have to make sure that customer help efforts increase sales and satisfy consumers rather than alienate them. Many websites feature icons that consumers can click to request help by starting an instant messaging chat with an Internet salesperson. Companies such as LivePerson and LiveOffice provide web retailers with software that allows customers to initiate help requests. This software also allows web retailers to use more aggressive help strategies, such as popping open a “May I help you?” window in the consumer’s browser. But Internet help is a fairly recent innovation. Since web shopping involves consumer experiences that are very different from store shopping it is not clear that help strategies that work well in face-to-face retail encounters will work well on the web. Marketing researchers have found that making recommendations that are consistent with consumers’ prior preferences can increase consumer satisfaction. Marketers have also suggested that Internet retailers can use computerized “smart” agents to estimate consumers’ preferences based on their characteristics and past behavior, and recommend products. But consumer help differs from consumer recommendations. Recommendations often involve providing information impersonally, and do not necessarily involve personal or Internet contact. By contrast, we define consumer help as an encounter where a retailer representative explicitly provides aid to a consumer regarding a consumer need, product attribute or attribute importance, or a purchase decision. And while help-seeking and help-giving have been investigated extensively in the fields of psychology, education, child development, foreign aid policy, and organizational performance, the existing marketing literature has given relatively little attention to the question of consumer help. Consequently, we set out to investigate which types of consumer help affect consumer satisfaction – in stores and online – how these strategies affect actual sales, and whether the best online strategies differ from the best in-store strategies. Researchers have generally distinguished three types of help: help requested by the person being helped; help offered by the helper, while allowing the recipient to accept or decline the help; and help imposed by the helper without first asking for permission. It is fairly simple to create strategies for each of the three help types, both online and offline. 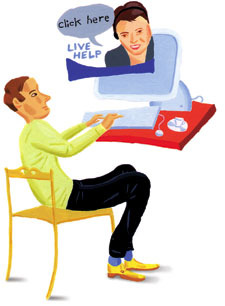 Consumers can request help in a store from salespeople, while Internet consumers can request help by sending an e-mail or clicking a help icon to start a help “chat.” Store salespeople can offer help by asking consumers whether they would like to be helped, while online retail personnel can pop open a window in the consumer’s browser and offer help. Store salespeople can impose help by giving consumers help without first asking for permission, while web retailers can impose help using an instant message window. People have both positive and negative reactions to receiving help. And consumers’ decisions on whether or not to seek help, and their reaction to help, can be viewed as the result of the relative weight given to the perceived costs and benefits. Requested help has a potential advantage over offered or imposed help since it allows the helped person to maintain autonomy and control. But past help research has shown that in face-to-face help encounters, people are more likely to have a more positive reaction when help is offered than when it is requested, because other factors outweigh the potential positive aspects of requested help. Requesting help may increase feeling of indebtedness to the help provider, and it can reduce self-esteem. People are also less likely to request help if their request is observed by other people. These factors, which have been identified in contexts outside of the consumer realm, are also likely to increase consumers’ perceived “cost” of requested help in face-to-face encounters. And so our first hypothesis holds that in stores, a help encounter that uses imposed or offered help will lead to higher consumer satisfaction than an encounter that uses requested help. Our second hypothesis holds that customers will have more satisfaction with a retailer when they request help during Internet shopping than during shopping in a store. Computer contact omits many of the visual elements that can form an important part of interactions in face-to-face encounters and makes requested help less attractive to consumers. Other consumers cannot observe consumers who make help requests over the Internet, and people are more likely to request help if they remain anonymous to the helper. The lower level of personal contact in Internet help also increases the psychological and social distance between the consumer and the help provider. At the same time, consumers are likely to still appreciate the greater autonomy, freedom, and control that requested help gives them. Our third hypothesis holds that imposed help will generate greater satisfaction in stores than on the web. Imposed help generally requires the greatest level of monitoring of consumers by retailers. Retailers of either kind cannot make a reasonable attempt to impose help without first observing customers. This need for monitoring may signal to consumers that they are being observed. If consumers believe that this monitoring invades their privacy, this can lower their satisfaction – particularly in online settings. While consumers have long accepted that employees in most kinds of stores, which are public spaces, may observe their actions as a prelude to offering or imposing help, people usually use the web in the privacy of their home or office. Many consumers are concerned that web monitoring invades their privacy. And so our fourth hypothesis holds that the impact of imposed help on satisfaction will depend on the extent to which the imposed help leads consumers to be concerned about their privacy. e tested these hypotheses with a study involving 135 undergraduates at a university in the northeastern U.S. Participants read one version of a help encounter with a salesperson in a bookstore or bookseller website. They were asked to “imagine that you are actually in this shopping situation” and then asked how they would react. In all scenarios, the participant was shopping for a friend’s birthday present and was trying to choose between books by two of the friend’s favorite authors. Participants were either told they were shopping in a store operated by Barnes & Noble, one of the largest retail booksellers, or on Barnes & Noble.com. The description of the help encounter with the salesperson involved either requested, offered, or imposed help. The scenarios for all three types of help contained the same help from the Barnes & Noble employee. 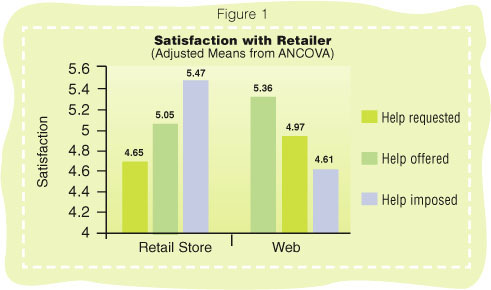 Comparisons among participants showed that when shopping in a store, satisfaction with the retailer was higher when help was imposed than when it was requested (see Figure 1). The comparison between requested and imposed help is statistically significant, while the comparison between imposed and offered help is not significant, although in the correct direction. Thus, our first hypothesis was partially supported. We also found that satisfaction in the requested help condition was higher for the website than the store, supporting our second hypothesis. By comparison, satisfaction with imposed help was higher for store than for web shopping, supporting our third hypothesis. It is interesting to note that the rank order of satisfaction for the three types of help in web shopping was precisely the reverse of their rank order in store shopping. For in-store, the rank was: imposed, offered, and requested. For online, the order was requested, offered, and imposed. hen we tested the hypothesis that privacy concerns affect the relationship between shopping context and satisfaction for imposed help, we found, as expected, that the average satisfaction for web shoppers was significantly lower than the average for in-store shoppers. The concern score when imposed help was received in web shopping was significantly greater than when this help was received in store shopping. These results suggest that, in general, web help generates higher privacy concerns than in-store help, and that imposed help on the web generated the highest privacy concerns of all. Why is that the case? Consumers’ expectations for retail shopping may include help, but their expectations for web shopping may not. If consumers are offered help during web shopping, this creates a discrepancy with their expectations that leads to surprise. 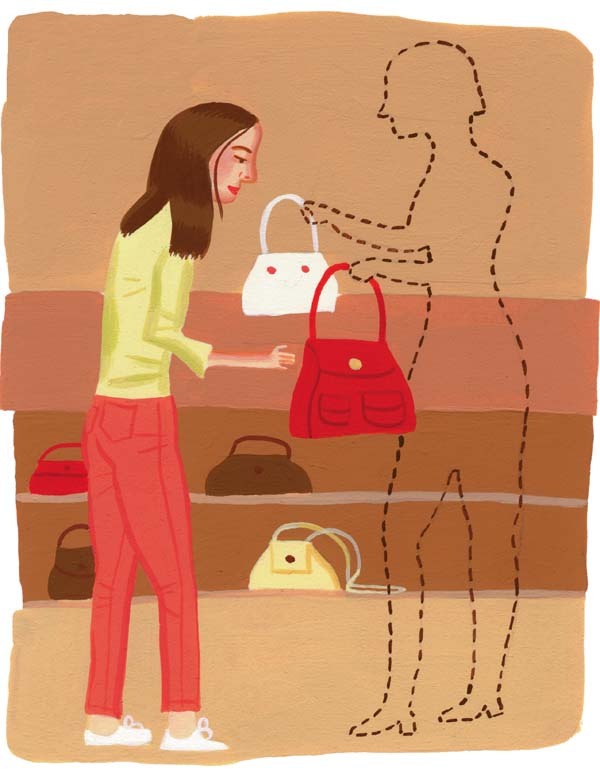 Unpleasant surprises can lower consumer satisfaction. As a result, we set out to examine whether providing web shoppers with advance notice that help may be provided would reduce privacy concerns, and in turn increase customer satisfaction. Doing so might tend to reduce feelings of unpleasant surprise and invasion of privacy at the time the consumer is helped. However, we expect that the impact of advance notification on satisfaction will vary across the three types of help. If consumers perceive a type of help as unusual, novel, and opposite to their expectations, advance notification can be expected to have greater impact. Specifically, we hypothesized that consumers will perceive imposed help as the least normative, and most unusual type of retailer help on the web; offered help as more normative; and requested help as the most normative. Thus, we expect that advance notification will have the greatest impact on satisfaction for imposed help and the least impact for requested help. To test these hypotheses, we designed a second study, with 132 undergraduates at a university in the northeastern U.S. who had not participated in the first study. This study used the same book-shopping scenario, but included the following advance notice condition as a variable: “The Barnes & Noble home page mentions that their sales agents might flash a message on your screen to help you with your purchase decision,” while the conditions without advance notice did not contain this sentence. n examination of comparisons between satisfaction with and without notification, for each type of help showed that, as predicted, advance notification had the greatest positive impact on satisfaction for imposed help, and a lesser, but still marginally significant, impact for offered help. But contrary to our expectations, advance notification actually decreased satisfaction in the requested help condition, although not significantly. One possible explanation: notifying consumers that they might receive help creates an expectation that they definitely will receive help. When they need help, but have to request it, this expectation is not met, resulting in lower satisfaction. Marketers must also consider whether providing help has a direct influence on sales. In a third study we analyzed actual data from a well-known, general merchandise retailer with both store and web operations. The retailer’s website includes an online help facility that lets consumers request help by initiating a live, instant messaging conversation with a retailer representative, by clicking on a live “chat” icon. This falls under our classification of requested, online help. So we hypothesized that the higher satisfaction associated with requested online help would make consumers who requested help using the online chat facility more likely to purchase from the web retailer than consumers who did not. The data were provided by a market research firm that recorded the web usage of a large panel of consumers from August 2002 to June 2003. During this time, panelists made 60,057 site visits to the retailer’s website, and purchased during 815 of these visits. We determined that panelists had requested help during 363 site visits. And we found there was a significant connection between help and sales. The proportion of consumers who purchased during a site visit if they requested help during the same visit was 38.3 percent. That was significantly higher than the proportion that purchased when not requesting help during the site visit – only 1.13 percent. We note that we can’t infer causality from this test. It is possible that consumers who request help are already more likely to purchase. The mean number of the retail site’s web pages viewed by panelists who requested help (46.8) was also significantly greater than the mean number viewed by those who did not request help (13.5). The results suggest that consumers use requested help to broaden, rather than narrow, the amount of information they obtain. ur studies have shown that the effectiveness of consumer help strategies in increasing consumer satisfaction depend, in part, on the shopping context. Firms can use these results to help design their help strategies. For example, retail stores can encourage salespeople to offer or impose help rather than waiting for consumers to request it. Internet firms, by comparison, should rely more on requested help. If they do wish to use imposed or offered help, web retailers should give consumers advance notification that they may be helped, to alleviate their privacy concerns. This notification, however, should be phrased in a way that encourages consumers to still request help if they need it, so that they are not disappointed if they decide to request help. Since consumers who request help tend to look at more web pages than those who do not, it is important that the web representatives providing help be knowledgeable about the product line and the site itself, so that consumers can obtain the information they seek to expand their web shopping. A number of factors not investigated in this paper might also affect consumer reactions to help or their willingness to request help, and are areas for future research on consumer help. For example, willingness to seek help can be affected by how the person in need of help perceives the physical attractiveness of the potential helper, and whether the two have the same or different genders. Males are often less willing to seek help than females, but are more willing to help. This behavior has implications not only for retailer’s in-store help strategies, but also for the picture and name of the helper that consumers see in an online-help facility. Web retailers might also develop capabilities for asking shoppers, at the beginning of a site visit, which type of help they would prefer to receive. For example, web shoppers who are allowed to choose which ad message they will view are more resistant to later information contradicting those ads, and have higher purchase intentions, compared to shoppers who were not allowed to choose among ads. Similarly, reactions to help might become more positive if consumers are allowed to choose from a menu of help types. While most consumer help in stores and on the Internet is provided by human beings, automated help systems for Internet retailers exist that do not require human intervention, such as ActiveBuddy. Given that peoples’ propensity to seek help is affected by whether they believe a computer is providing the help, there is a need to examine the potential advantages and disadvantages of such help systems, and identify contexts where automated help is most effective. Just as companies have combined online and off-line retail strategies – so-called clicks and mortar – there are signs that retailers are taking both approaches. Liveperson has developed software that allows retailers to use decision rules or intelligent agents to decide whether and when to provide offered or imposed help to web shoppers, but then connects consumers who consent to help to a real person for further assistance. Consumers may also be less likely to feel that their privacy is invaded by offered or imposed online help if they know that the web retailer’s decision to contact them is the result of a computer applying an automated rule, and not because a human being was monitoring their behavior. Russell S. Winer is the Deputy Dean and William H. Joyce Professor of Marketing at NYU Stern.